Goodbye CP.2 - Hello CP.3! A lot of folks want to see actual footage instead of just numbers when it comes to the practical look and feel of a particular lens. And as usual, Zeiss delivered. Here is a small collection of short videos that feature different primes and even a few zooms that Zeiss currently offers. The first video is a “Sizzle Reel” with a lot of quick takes from different scenes using different lenses. Zeiss used a range of focal lengths including the 15mm T2.1, 21mm T2.9, 25mm T2.1, 28mm T2.1, 35mm T2.1, 50mm T2.1, 85mm T2.1, 100mm T2.1 CF, 135mm T2.1, and lastly the 70-200mm T2.9 and shot a nice panning shot and a static rotating shot with each focal length. Take a look and gather all you can from this collection of results. 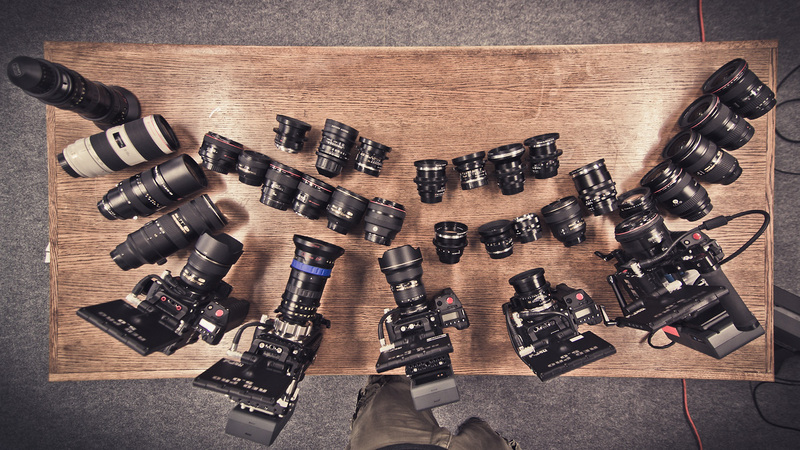 Having trouble keeping track of all the new cinema zoom lenses offered by manufacturers such as Angenieux, Canon, Arri, and Fuji? Fear not my friends. Here is a quick reference chart showing most of the common zoom lenses used by professionals around the world. Feel free to download and share. The following from a Zeiss press release dated 08.30.12. Carl Zeiss will display the new cine zoom lens Compact Zoom CZ.2 28-80/T2.9 at the IBC in Amsterdam, the leading international trade show for film, radio and television, from September 7 to 11, 2012 in hall 11 booth G64. The new Compact Zoom CZ.2 28-80/T2.9 by Carl Zeiss is a cine zoom lens ideally suited to a wide variety of shooting situations. It is easy to handle, compact and versatile. It takes pictures in 4K resolution — in full format. This is the second Compact Zoom CZ.2 lens from Carl Zeiss, complementing the Compact Zoom CZ.2 70-200/T2.9 presented in April at the NAB Show 2012 in Las Vegas for the longer focal length range. For color rendition, contrast and other parameters such as great flare suppression, calibrated focus scales, consistent aperture over the zoom range, round iris the new CZ.2 family is closely aligned to one another, making these lenses ideal for attaining a con- sistent optical performance when changing lenses. Just finishing up an overhaul on a RED 18-85mm RED zoom. The zoom focus and iris all needed some new grease after some heavy shooting. This lens is built quite well using nothing but aluminum alloys and high quality hardware. A cam driven zoom converter and a helix based focus assembly join to make quite a nice optical-mechanical tool. Angenieux 17-80mm T2.2 on the test projector. A quick snap-shot while bench testing a 17-80mm for periodic maintenance. The modern breed of exotic zooms are both work-horses and delicate instruments of perfection at the same time. They require the highest level of calibration to perform at their maximum potential. The 17-80mm was the second lens to join Angenieux’s Optimo team back in the mid 2000’s and is still one of the best 35mm zoom lenses on the market. After regular use on a television series, this particular Optimo only needed minor back-focus calibration and exterior cleaning. It’s no wonder Angenieux is having trouble keeping up with demand for their zooms. RED recently announced that they were redesigning the front housing on their 17-50mm T 2.9 zoom lens. The previous housing had an abnormally large front diameter. The optics measured roughly 80mm at the front whereas the housing was a whopping 144mm. This made it very difficult to use the lens for 3D work since the lenses couldn’t be positioned close together. The lens is relatively light weight, but when paired with a matte box that was able to accommodate such large front, the rig suddenly becomes quite heavy. Previous front housing design of RED 17-50mm. Well, this is proof that REd listens to their customers. There is absolutely no reason, other than pleasing their customers, to change the housing of their lens. BAM! Well done RED! The new housing is a rather common 114mm diameter and will look relatively similar to the RED Pro Prime lineup. As far as I can gather, this is how the lens will ship from here on out. RED is offering an upgrade for existing lenses for a mere $250. If you ask me, this is a great deal. The material alone probably cost close to $200 for RED. So stop complaining about the salad bowl that is your 17-50mm RED and send it in for this upgrade. Angenieux has long been the standard for cinema zoom lenses and certainly isn’t stopping anytime soon. NAB brings out the best in new lens manufacturers (and sometimes the worst) so Angenieux took the opportunity to announce their new addition to the Optimo series of lenses. This time it’s a 45-120mm. A little on the longer end of an all-purpose zoom, this will share a lot of the same features as the other light weight zooms like the 15-40mm and the 28-76mm Optimo. It will cover a full Super 35mm sensor/film utilizing a 31.4mm image circle and will feature an interchangeable mount with options for PL, Panavision, Nikon F, and Canon Eos. Interchangeable Nikon F and Canon Eos Mount. The focus scale has 320° of rotation which is about as much as anyone could every want and offers separate interchangeable metric and imperial scales. It will weigh in at 4.3 lbs. making it perfect for lightweight, steadicam, and 3d rigs. It’s a constant T2.8 which isn’t the fastest zoom in the world, but it’s certainly not the slowest and matches well with other pro cine zooms. I’m sure we can expect the same accuracy and quality as the rest of the Optimo lenses. It’s focal range, 45-120mm is a little long even at the wide end giving it a horizontal angle of view of 27.4°-10.5°. A 45mm in a S35 frame is fairly tight and 120mm on the long end gives it a nice versatile throw. It’s 2.7x zoom ratio drops it in the same boat as the other short zooms. I’ll be looking forward to getting my hands on this little bad boy from Angenieux and putting it through the paces. I have no doubt I won’t be let down. Canon is releasing a couple of PL mount zoom lenses. Some might think this is a step in a new direction for Canon but they had great success with their 16 format zooms back in the late 80’s in the form of a 11-165mm and 8-64mm that were based on some of their popular video lenses.The optics and core mechanics were transplanted into a cinema friendly housing. The lenses worked great and performed very well. You can still find them floating around rental houses and private owners basements since they only cover a very small 16mm film format. Canon's previous 11-165mm S-16mm lens. If these two zooms are similar to Canon’s previous lens ventures, then they should perform very well optically and mechanically. I look forward to seeing these pups at NAB and bench testing them when they come to market. Good luck, Canon! The Cooke 20-100mm is a workhorse of a zoom lens. It’s solid build quality combined with classic “Cooke Look” glass make it a very desirable lens in the current HD market. The other option is to drop a pretty penny on a stellar new Angenieux 24-290mm. The current champion of motion picture zoom lenses. These two cinema zoom lenses are decades apart and even farther apart in cost. An average Cooke 20-100mm costs a mere $7,000 compared to the going rate for a new Angenieux 24-290mm at around $63,000. A little background on these still samples. These were shot with a 35mm full frame 5D which means the vignetting is severe and expected. The settings were the same for each lens, 100mm at T4, ISO 100, 5100K color temp etc. Here are the samples.